Clematis ligusticifolia blooms from late Spring through to Fall. 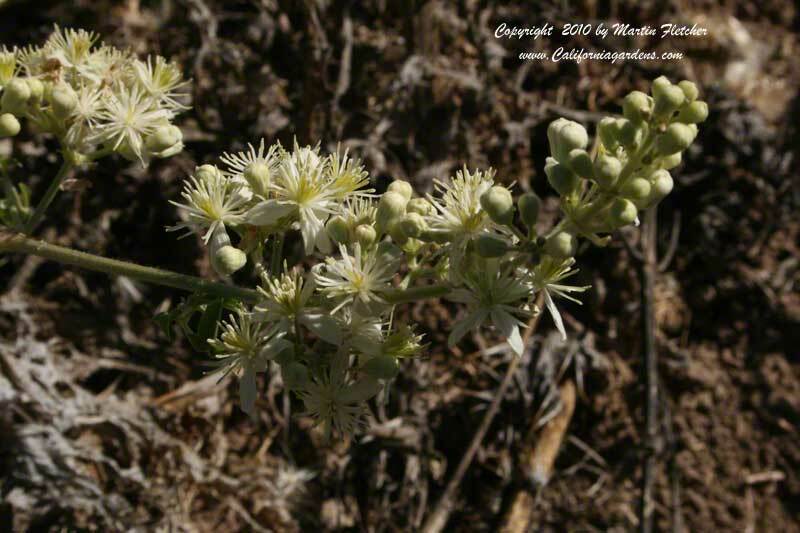 The Creek Clematis can be found throughout the state at lower elevations. Creek clematis clambers over bushes or can grow up to 20' or more up into trees with the flowers trailing below. You can often see the flowers of the Creek Clematis draped over shrubs or trailing out of the trees in the Summer. I like the white poppy-like flowers as well as the feather duster seed heads. Clematis ligusticifolia was use medicinally. The roots are generally found growing in the shade, the top of Clematis ligusticifolia is generally in the sun. Clematis ligusticifolia can be found growing in moist or dry soils from creek banks up into the chapparal. Flowers and foliage of Clematis ligusticifolia known as Creek Clematis, Virgin's Bower, or Western Clematis. High resolution photos are part of our garden image collection.